Outdoor winter running leaves us with incredible strength and balance. The heavy clothing and varied footing play into developing the ancillary muscles of the body that keep us from injury. These wicked runs will give us the armor we need to fight our way back to the higher mileage runs as the world thaws. The mental toughness needed to get out into the cold will give us the confidence to survive anything the spring long runs and races throw our way. Bring it on! No matter how tough it gets out there, we will be tougher! Randy Step, an admitted obsessed runner, heading out with traction on my shoes and my gloved middle finger pointed at the weather! P.S. : HUT, HUT! Join us before the big game on Sunday, February 3rd in Novi, MI as we gather in a game day atmosphere before dashing out to run or walk 3.1 miles at the SUPER 5K! Beanies to all entrants, medals and pint glasses to all finishers... AND YOU SHOULD SEE THE POST RACE SPREAD! P.S. : Time to start thinking about your spring goals! 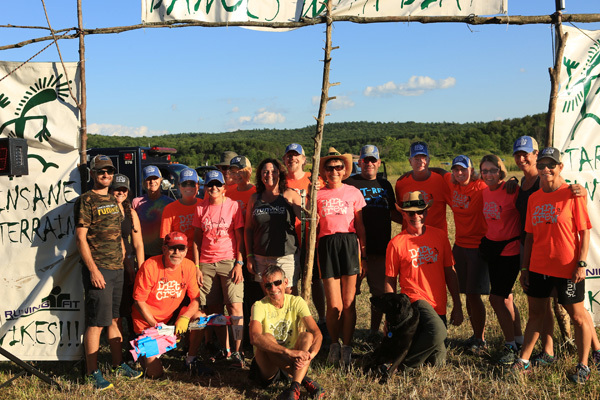 There are 100 days until our favorite spring tradition - Trail Marathon Weekend! This Michigan classic is now in its 33rd year! Join us April 27th and 28th in Pinckney, MI for 5 Miles, 13.1 Miles, 26.2 Miles or 50K! Wooden medals to all finishers and cozy patch beanies to all entrants!